Indonesia’s cosmetics sector performed strongly throughout 2017 in line with the country’s growing middle class and increasingly affluent consumers. The implementation of halal regulations for cosmetics in Indonesia has proven to be a game changer with halal cosmetics now starting to dominate cosmetic sales in the country. Wardah, the country’s first halal cosmetic manufacturer, has successfully capitalised on the new trend and has become a leading cosmetics brand in Indonesia. Indonesia’s cosmetics and toiletries industry recorded a remarkable growth of 11.99% in 2017 with a total sales value of 19 trillion IDR. This is higher than the industry’s average annual growth rate in the last six years of around 10%. The same holds true for cosmetic product exports which also grew by an average of 3.56% in the last five years. As of September 2017, Indonesia’s National Agency of Drug and Food Control (BPOM RI) reported that there were 33,823 registered cosmetic products sold in the country. This is an increase of 11.57% compared to the same period during the previous year. The market size of Indonesia’s cosmetics industry in 2017 reached 46.4 trillion IDR, up from 36 trillion IDR from the previous year (See Overview of Indonesian Cosmetic Sector: Growing Domestic and Export Markets). Nevertheless, not all cosmetic manufacturers enjoyed such a positive performance. Besides Wardah, other national cosmetic manufacturers felt the impact of the global economic slowdown and reduced public spending (See Indonesia’s Second Semester Economic Outlook: Focusing on Investments). This segment of Indonesian women feels that it is their religious duty to wear Islamic clothing and cosmetics. 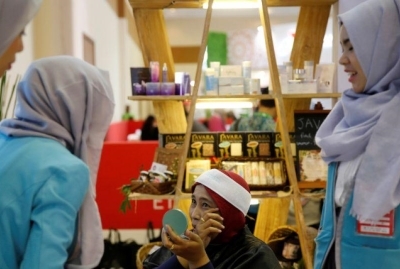 According to a survey, 58% of women in Indonesia now prefer to use halal cosmetics. They place a greater emphasis on halal certification over price, packaging, organic ingredients and other trends. The implementation of the Indonesian government regulation on halal product assurance as a derivative regulation of Law No. 34/2014 on Halal Product Assurance in 2017 has further increased demand for halal cosmetics (See Halal Implementing Regulations – Where are They at Now?). This changing trend, which is also identifiable in sectors of banking and finance (See Islamic Banking in Indonesia – A Giant Waking Up) as well as hospitality and tourism (See The Rise of Halal Tourism in Indonesia), has given halal cosmetic manufacturers in Indonesia an advantage. The market share of Wardah, Indonesia’s first halal cosmetic manufacturer, continues to rise and in 2015 held 16% to make it the second largest domestic cosmetic manufacturer after Martha Tilaar. Since then, Wardah has consistently recorded 20%-50% annual sales increase, which is disproportionately higher than that of other manufacturers at around 10%. The company’s monthly sales value in 2014 reached 200 billion IDR, significantly above its two largest local competitors, Martha Tilaar and Mustika Ratu, which recorded an annual sales value of around 400 – 600 billion IDR. Wardah’s growing dominance in the domestic cosmetic market can also be seen from the increase in the number of its products which received top brand awards from one in 2014 to ten in 2015. The success of Wardah has attracted its competitors to follow in its footstep. Zoya, a prominent hijab producer, recently introduced its halal-certified cosmetic line. Martha Tilaar, L’Oreal and Unilever have also obtained halal certification for many of their products in order to tap into this growing market segment.